Nothing beats a large nutrient rich, fresh salad to quick off the week after 4th of July weekend. Yep…I am guessing most of you misbehaved….I know I did! So to help you start THIS week right, I offer you my favorite vegan salad. 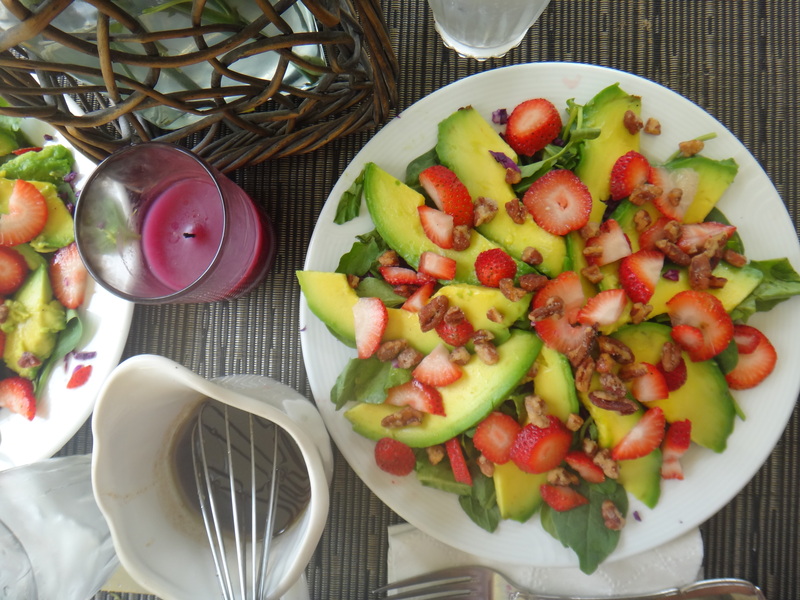 Now I had NEVER tried avocado and berries together before this…and let me say: wow. The avocado pieces add a creamy richness which makes this salad a very satisfying lunch or light dinner. The berries pack sweetness, vitamin C and antioxidants. The nuts add protein and healthy fats… plus recents studies have shown that eating 3 portions of walnuts weekly may help lower your risk of developing type 2 diabetes. No surprise there! It also helps promote cardiovascular health. If you are not a meatless fan, this salad goes great with lean poultry or tuna fish. I served this with some tuna filets cooked with minced garlic, fresh ginger root, salt and pepper – it’s a heavenly combo! So breaking further the salad ingredients… Watercress can be used instead of spinach to add diuretic properties to the salad, this will help you get rind of the toxins you accumulated during the weekend. The red cabbage is fiber rich which will also help you detoxify by flushing out the toxins, but through your gastrointestinal system. Their combined properties will help you de-bloate. Avocado also provides vitamin C – a powerful antioxidant, which will have synergistic effects with the berries to help beat those free radicals you could have accumulated by drinking alcohol, smoking cigarettes (or being a victim of second hand smoking) or by just lying around all day in the sun! Making salads is not a science; add more or less of your favorite ingredients. Slice the avocado and strawberries. Chop the cabbage to the desired size. 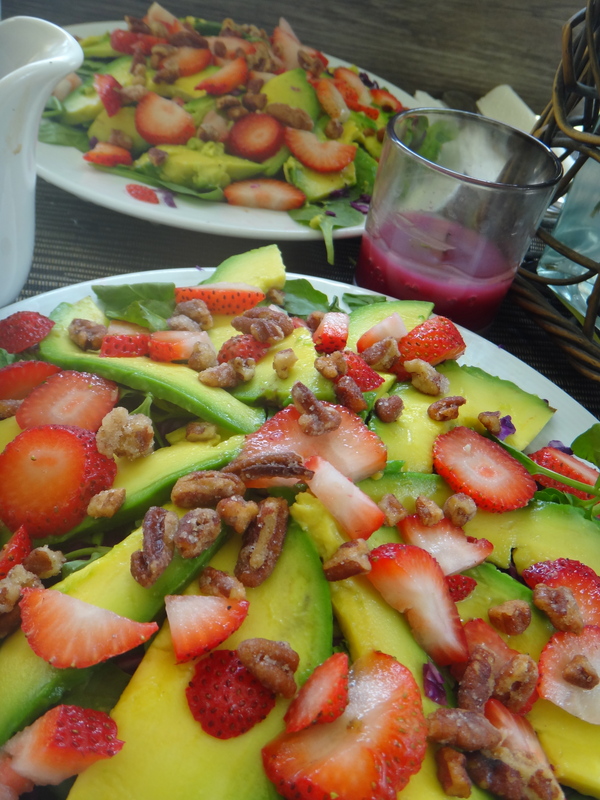 Arrange the leafy greens first followed by the cabbage, avocado slices and berries. Top with the nuts. Feel free to add goat cheese or other protein sources. * You can use regular “young” balsamic but will probably need to add more honey to thicken the dressing. Alternitively refrigerate for a couple of hours, you will notice a change in consistency. Did you misbehaved on the 4th? Have any detox plans? Feel free to share below. Mmm, this looks so good! I can’t wait to make this!! Thanks!! 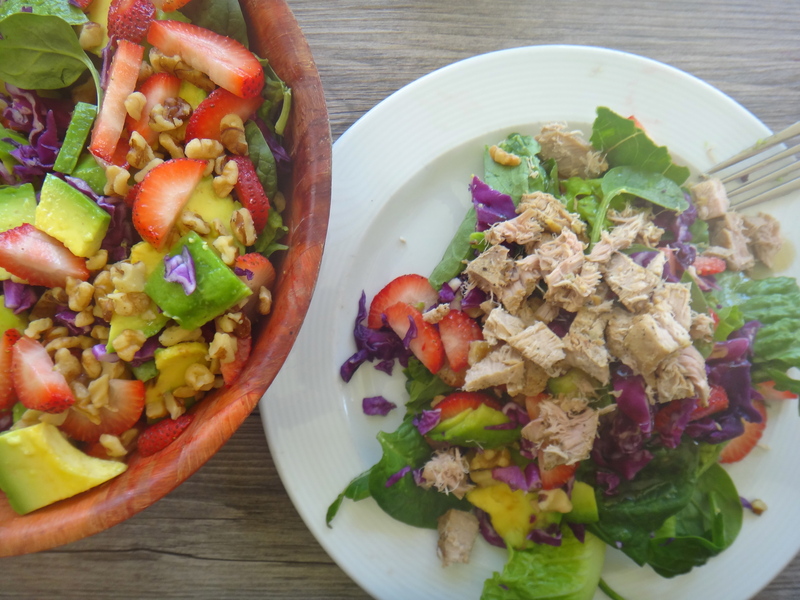 It’s my favorite salad so far…plus it’s so good for the hotter months of the year & it’s bikini friendly!